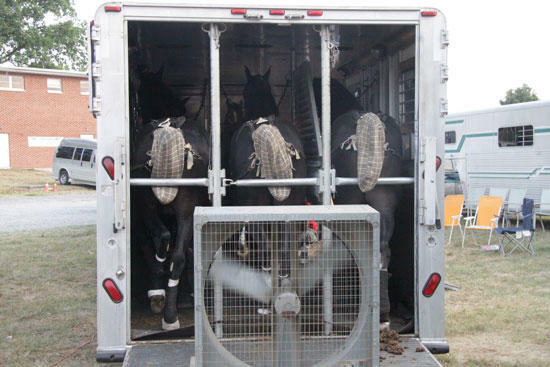 A fan provides cool air for hot horses as they wait in a trailer during the annual Woodbury Lions Club Horse Show. A rousing ovation greeted Gameworld, the 2011 World Grand Champion, when he entered Clayton Glenn Champions Arena as the flag horse for the 2012 Woodbury Lions Club Horse Show Saturday (July 7). The ovation was critical in that its volume indicated a large crowd on hand despite temperatures reaching well into the century mark for a fourth straight day. Fans weathered the blistering heat and they were rewarded as more than 320 total entries put on a strong show. "Going into it I was scared about the heat and how it would effect us," said Bruce Steelman, Horse Show chairman. "We had 100-degree weather. The grounds were just brown and it was a tremendous concern for us." Concerns subsided when Horse Show enthusiasts flocked to Woodbury for the 74th event. The box seats were full and a crowd of more than 2,000 was estimated during the two sessions. Heat also was a concern for the participants and entrants. Steelman said precautions were taken to assure the well being of all involved. "We had water accessible at every possible location on the grounds," Steelman said. "We worked to keep the animals cool and have fresh water for them, too. We were concerned whether the heat would affect the health of exhibitors, riders, the horses. When it was over there was not a single incident. The first responders on hand never replied to one case." The heat did impact the afternoon session as a sparse crowd was on hand to see the 130 entries. "I don't blame them," Steelman said. "It was hot." But the start of the evening session; however, the box seats were full, fans were filling both grandstands and filling around the arena. "At that point you knew we were going to have a show," Steelman said. "Clayton Glenn laid the foundation for us to have shows like this now. Tradition is a big reason many of the current trainers bring their horses to Woodbury for the Lions Club Horse Show."